Nope, American Hooch is not dead yet. It’ll take more than a move out of NYC and graduate school to get in the way (at least, I hope that’s true). So to celebrate my first post since June when I wrote about my case of the dreaded and whiskey-ruining Pine Mouth, I’m opening up a bottle of Laird’s Old Apple Brandy. 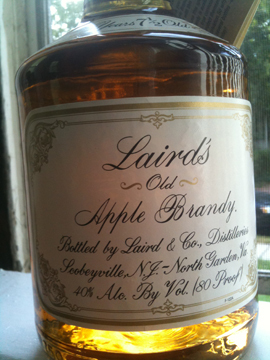 I’m a fan of American apple brandies, and I try new ones whenever possible, but Laird’s is easily the best-known maker. Their younger variety (not to be confused with the Applejack) was one of my mainstays back in New York – where it was more readily available than here in Massachusetts. I haven’t had the opportunity to try the Old Apple Brandy before today however, so I’m looking forward to it. Aged 7 1/2 years in charred oak and bottled at 80 proof, and apparently made in pot stills, this should be interesting. I have to admit that the bottle doesn’t have much going for it style-wise. The label’s text is in an uninspired script and the background consists mostly of awkward whitespace with some tepid gold flourishes in the corners. I do, however, enjoy their logo of the brandy snifter wrapped with a starred banner. The message on the back is earnest in its no-nonsense font, but tries to convince us just how special the bottle’s contents are. It would have been nice to use something other than the standard plastic-capped bottle for this, but it probably does keep the cost down. The nose is a lot subtler than the younger Laird’s Apple Brandy, but it comes through with orange peel, soft caramel, and a hint of burning sap-filled tree bark that sneaks through. It is very soft on the tongue with a well blended mix of flavors: starting of sweet with notes of strawberry, then shifting to a prominent apple flavor and a bit of char pushing forward. It settles down into a medium-to-long finish of dry grass and a dose of pepper. Laird’s Old Apple Brandy is definitely more refined than their regular Apple Brandy, the age has done it well in that respect. This is something that you can and should sip slowly. The flavors are well blended without disappearing. That said, I think I still prefer their younger, bolder variety. Still, this is a very nice apple brandy.